Jim Rey loves to paint the cowboy life. 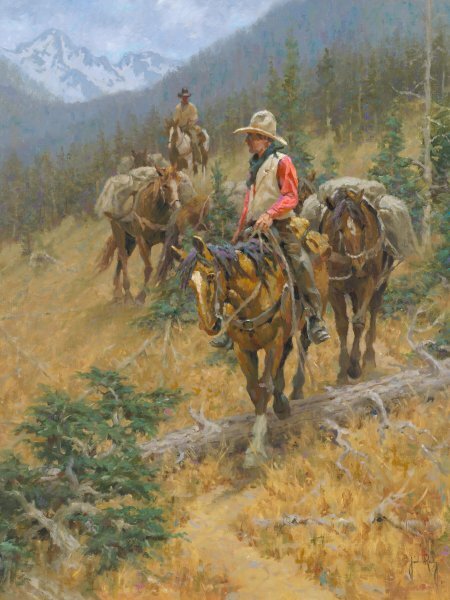 These two cowhands lead their pack horses as they work their way down steep terrain. This "Mountain Trail" perhaps leads them back to their camp, but they know the harsh landscape offers many challenges for them and their horses. Having grown up in a ranching family, western artist Jim Rey naturally loves working with horses and cattle. His eyes light up when he talks about training his Border Collie or a particularly wary horse, the days he has spent gathering cows in the high county or following a herd of wild horses. The paintings of Jim Rey tell the story of cowboys as living remnants of a bygone era. The stories he paints are both his own and those of the people and places he knows and loves. The work of Jim Rey is collected nationally and internationally. His art has been exhibited in the Fredric Remington Museum in New York, as well as in many noted shows and exhibitions. His paintings have been used by Bantam Books and Encyclopedia Brittanica. Articles have been published in magazines including Southwest Art, art of the West, artists of the Rockies and International Fine art Magazine. The work of Jim Rey has also been featured in such newspapers as the The Denver Post, The Rocky Mountain News, The Durango Herald, The Vail Times and The Aspen Times. Jim Rey and his wife, Sharon have recently moved from Southwest Colorado to a farm in the sand hills north of Mitchell, Nebraska, in search of wide open spaces and fewer people. The open plains to the south and east, the Rocky Mountains to the west and the cattle ranges to the north are inspiration for his paintings of life in the American West.